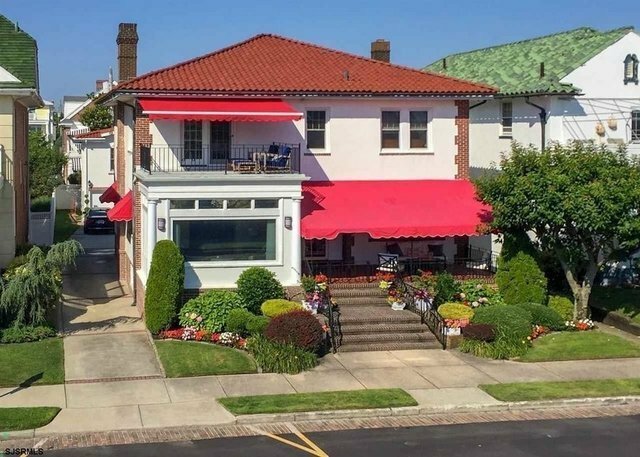 A beach-block house thatâs just steps from the Ventnor Boardwalk and the gorgeous sand and surf beyond, this one month rental is the retreat youâve been waiting for. The beautifully maintained property matches lovely traditional interiors with desirable modern upgrades over two spacious floors. A separate bedroom and bathroom atop the standalone garage provides an added perk for guests seeking a little more privacy. The main houseâs classic center stair design separates the spacious living area and its adjoined sun room from the dining room and the gorgeously updated chefâs kitchen. The kitchen stuns with an oversized center island with a built-on breakfast bar and second sink. Double ovens and a wine refrigerator will make entertaining here feel effortless. Upstairs there are four amply sized bedrooms and three full bathrooms, some of which have serene ocean views. A grassy backyard and private porch that gets abundant sun round out this unparalleled rental for any time of year. Available July or part of August $7000 a week or $13,000 for a two week period. Owners are flexible for options at the right price.